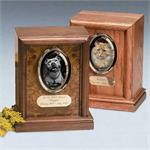 Topton is part of our Cherished Moments line of pet urns. 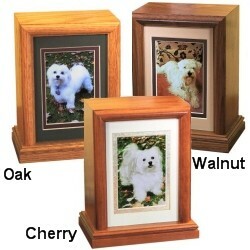 This urn is designed to display one of your many "cherished moments" in the form of a 4" x 6" vertical photograph of your pet. Each urn comes with a glass window and photo mat which slides out of the bottom of the "opened" urn for easy installation of your favorite photo. In your choice of Cherry, Oak or Walnut.